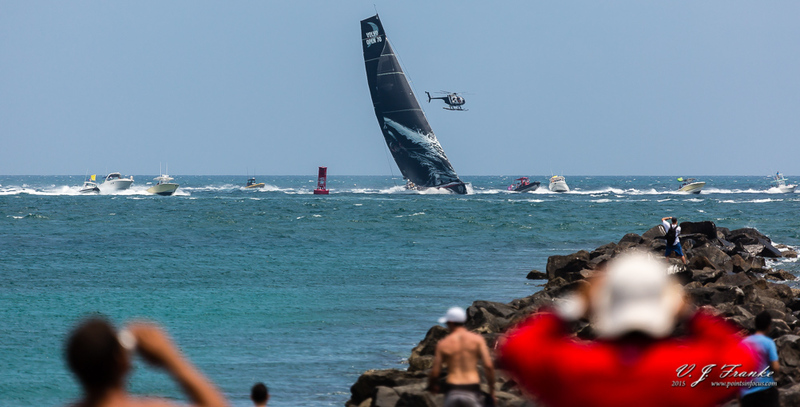 Spectators watch 2012 Volvo Ocean Race boat Mar Mostro take the leg win as it arrives at the port of Miami. Puma Ocean Racing's entrant in the 2011-2012 Volvo Ocean Race, Mar Mostro (Monster of the Sea), sails with the spectator fleet after winning Leg 6 (Itajai, Brazil to Miami, FL, United States). The Volvo Ocean Race is a 39,000-mile, 10 month, regatta that circumnavigates the globe stopping briefly in ports around the world to replenish, race, and make repairs.